Safety is the number one concern of our contractor members, so it’s the number one concern of MCA Chicago. We continually search out and produce safety materials that will help keep our contractors’ work sites safe. 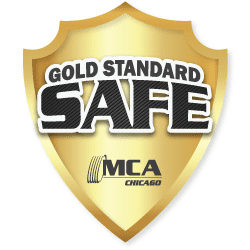 MCA Chicago has developed the Gold Standard Safe best practices program as a way for you to prove irrefutably that you hold the highest safety standard in the industry. Meeting the criteria below makes you a Gold Standard Safe contractor, allowing you to use the Gold Standard Safe icon on your website, business cards, and wherever your customers see your name. You say you’re safe. So now, prove it! Have an officer of the company promoting safe work place decisions. Apply for MCA Safety Awards. Have at least 95 % of field employees complete OSHA 10 or 30-hour. To learn more about becoming Gold Standard Safe, contact our safety expert and Senior Vice President, Dan Bulley, at dbulley@mca.org.